- I'm likely out on the road right now heading off to Lean Horse. Since I won't be running today, I've posted an entry from our group's running site about my running shoes. This is from March of 09....enjoy! As most of us have read or heard before, there are many stressful events a person can come upon in their lifetime. There are many top stressful events people mention, and in no particular order, some of the events repeated in different articles are death in the family, marriage/divorce, new family members, loss of job, and variations of each. No doubt even many reading this can attest to these as top life stressful events. For each of us, running is possibly part of the solution or our way of coping with life’s large or even not so large stressful events. I could easily go into depth regarding any one of these items. Lately though, changing shoes has been on my mind. For many, including even some runners, changing shoes is not a big deal. Then, for some runners like me, changing shoes is a HUGE deal. When I first started to try and lose some weight back in 2002, I remember slipping on my old indoor soccer shoes. I started with a run/ walk program and eventually worked my way up to two miles. Once I started to run a bit more, I bought whatever cross training shoes that seemed to generally work. After a couple of months, I would head over to Kohl’s and search out the cheapest and nicest looking shoe to fit my need. Then I started to hit about 5 miles at a time and going more than 20 miles a week. Although I had already made a commitment to running, it was time I stopped playing the field of shoes a settle into a long term relationship with my sole’s mate. The new friends I made through running suggested I go to Fitness Sports. After spending what seemed like the entire afternoon of trying on shoes, I slipped on a white and royal blue Saucony Grid Omni 3 shoes that provided a sliver of heaven for my feet. The heel cushioning was soft, the weight of the shoe was light, and the fore foot toe box fit my feet like soft leather gloves. Some romantics let you know they found their true love once their eyes met their future partner for life. I did not experience this with my wife and thought that I never would (for the record, I dated my wife’s roommate, and pulled off the roommate switch, another story for another time). However, once I laced up that Saucony Omni shoe, I just knew I found that shoe; or maybe THE shoe for me. I spent much time over the next few years with my beloved Saucony shoes. Like any relationship, it evolved over time. For me, I was running faster, longer, and more often. She went through some color changes and fabric updates (Omni 4 and 5). The changes each of us were going through seemed to compliant the other. We began to think nothing of setting new PRs as each race we seemed to just get stronger. The ultimate goal was beginning to become clear and it was time to shoot for a Boston Marathon qualifying time. We kept up our intensity of the training and soon began to realize our goal could be attained. After many hours of emotional high and lows through training in cold, hot and damp weather, we decided to make a run for our goal at Grandma’s in 2006. I remember it well, as the black flag of death was placed out that day due to intense heat in the early summer run. However, without doubt, I knew that I and my Saucony Omni could do it. Through the heat and many water stops, I remember crossing that finish line while fist pumping as the goal became a reality. 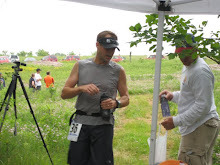 I remember after the race, although surrounded by many volunteers, I sat on the ground to slip off the “more than good friend” that led me to my goal. We did it. After that run, we had a great summer. With the pressure of getting a Boston Qualifying time off our shoulders, we ran just for the love of running. Later that year, we smashed our Boston qualifying time by 4 minutes; setting my ultimate marathon PR of 3:06. Then, we both seemed to change, this time, we didn’t change together. My miles began to increase, and the comfort she once provided wasn’t there any more. She changed her colors, and went to a new “Pro” grid instead of the “regular” grid. She must have thought this to be an improvement; however, to me it only made matters worse. My shins began to feel the effect. I tried to hang on to what we had built over the years by ignoring the new changes and focusing on the old items that once made us click. However, it just was not met to last. After a good six years, I needed to move on. Since last fall, I started to try out some various shoes. Nike, New Balance, even a pair of Asics as a rebound shoe; but nothing seemed to fit as well as those Saucony shoes. I even came across a new pair of the old shoes in my closet. I occasionally wear them, but I know there is no future for me and this shoe. Last week, I went to the Running Room and slid on a pair of Addis SuperNovas. Uh-oh, what is this I feel? A sliver of heaven for my feet.